Alabama House Speaker Mike Hubbard launched his new book Storming the State House: The Campaign That Liberated Alabama from 136 Years of Democrat Rule with an appearance in Washington, D.C., at a reception hosted by Mississippi Governor and RNC Chairman Haley Barbour, where Hubbard signed the book with other members of Alabama’s congressional delegation in attendance. Storming the State House details the historic 2010 election that saw Alabama’s first Republican legislature in modern history. The book also offers an inside view of the long hours, fundraising, and campaign-building that goes into successful bids for political office. The book begins prior to Hubbard’s own bid for party chairman. As Hubbard told Mike Huckabee on The Huckabee Report radio show, it was former Alabama Governor Bob Riley who persuaded Hubbard to run for the position (despite Hubbard’s early misgivings), a decision that ultimately lead to the Republican Party’s success. 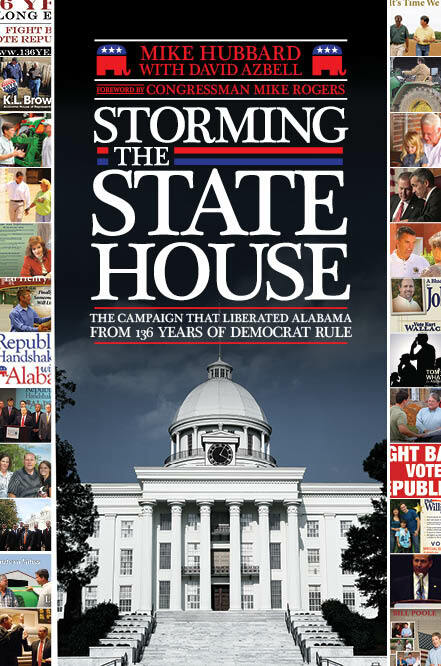 Mobile Press-Register political editor George Talbot writes that Storming the State House is “part memoir and part political tell-all, [but] it is foremost a playbook for how to organize, fund and win elections. Hubbard’s formula for success is no revelation — recruit good candidates, provide them the resources to run and keep a relentless focus on voters. Some of those eyebrow-raising items, already highlighted in a flurry of media attention, include the credit Hubbard gives to former White House Chief of Staff Rahm Emanuel for indirectly guiding Republican strategy. Hubbard told the Daily Caller website that he studied closely a book about Emanuel’s own Congressional win, The Thumpin’. Hubbard also describes in the book strange behavior he and aides witnessed from former South Carolina governor Mark Sanford, shortly before Sanford would be involved in a highly publicized scandal. Hubbard’s book has been featured on the Politico bookshelf, and also recently highlighted by the Associated Press and in the Tuscaloosa News‘s Dana Beyerle’s Capitol Insider column. Storming the State House is available in hardcover and ebook formats direct from NewSouth Books, Amazon or from your favorite bookstore. You are currently browsing the archives for the Storming the State House category.